Ginisology: One Lovely Blog Award~ What a lucky girl I am! 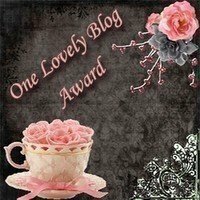 Once again I am touched and honored, Cheryl over at Heritage Happens has nominated me for the "One Lovely Blog Award", thank you Cheryl, you always put a smile on my face! I too feel special that Cheryl thought enough of my blog to give me this award. I could keep going, there are so many that deserve this award, hopefully you will stop by others and pass it on. Thanks again Cheryl, what a surprise and I am still smiling! Your welcome Leah, I am still grinning too after Cheryl picking me! Thanks so much, Gini! I'm honored that you feel my blog deserves this award. I love reading yours. You have such a warm and understanding nature, I love reading about your genealogy quest. But I also like getting to know your family. Thanks again! Thank You so much Gini! I appreciate it especially because my blog is so new...What a lovely email to wake up to @ 5am [and usually there's nothing lovely about 5am]! It's so great to hear from new readers and find out about blogs I'll enjoy reading. I write my blog so someone will remember me when I'm gone, and to form a link between my ancestors and descendants. I love the quote on your sidebar. Thank you for this lovely blog award! I'm flattered and will happily pass it on! Thanks so much for thinking of me! Yay! Gini - thank you so much for the award. It's very thoughtful of you to think about li'l ol' me! I am late in getting my thank you notes out Gini! 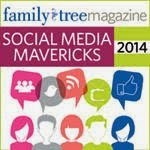 Thanks so much for the award - I love your blog and am glad you are a part of our geneablogger community!